Open scholarly communications are being suffocated by for-profit and large-scale academic publishers on the one hand and undermined by commercial academic social networks on the other. A possible part of the solution to both is ScholarlyHub, a new initiative to create a non-profit digital commons. ScholarlyHub proposes to serve as a social ‘front end’ of the open access movement and offer an aggregating space for diverse initiatives in the world of scholarly communications, from mentoring and pre-print services and data storage, to peer review and publication. This article explains the pressing need to ‘clear the garden’ in order to enable research to flourish in its natural environment and details the progress of ScholarlyHub to date, looking ahead with optimism to a more collaborative and open future. In ecobiology, an ‘invasive plant species’ is one that takes over a natural habitat and competes with native species for food, air, water and other resources. The invasive species grows so fast that native species are no longer able to survive. At some point, native plants die out, leaving the invasive species to thrive in a monopoly over its new habitat. Scholarly communications is one such habitat in which we as researchers have allowed an invasive species – the private, for-profit academic publishing industry – to take over the resources we need and use to create and disseminate knowledge. With a revenue stream of nearly US$10 billion (and growing), private, for-profit academic publishing is threatening to choke out all other, smaller forms of knowledge creation and dissemination, leaving companies like Elsevier, Springer Nature, SAGE and Wiley as the sole plants in the scholarly communication garden. At ScholarlyHub, we are determined not to see that happen and are working to clear the garden, a little space at a time, to allow for research to continue to grow and thrive in its natural environment: the world of non-profit, researcher-owned and -operated scholarly communication. How did the scholarly landscape get to this stage? It is scandalous that academic publishing has reached this scale of growth and financial invasiveness, but it is hard to blame companies for wanting to expand. The ease with which they have been able to do so can also be traced to an addiction to prestige on the part of academics and wilful ignorance and apathy from both academics and the general public. The publish-or-perish mentality pervasive to many scholarly fields likewise plays an important role in this syphoning of billions in public and foundation money, re-routing it towards for-profit publishing conglomerates. Funders are effectively financing publishers’ advanced infrastructures and unwittingly helping them to become major players in the data market evolving before our eyes. If data are the nutrient-rich soil feeding our scholarly systems of knowledge creation and sharing, then for-profit publishers (and not a few of the larger big-business model university presses, it must be added) are overrunning the scholarly garden, sucking up as much of that soil as they can get their hands on to claim the intellectual rights to and mine scholarly output at high cost to the researchers and institutions originally providing that data for free. These data are fast losing their inherent value and becoming a means for exploring the consumption1 patterns of academics and scholarship-using communities around the world. This leads us back to our scholarly communication garden: not only is the large, private academic publishing industry growing at an alarming rate, it is simultaneously draining the lifeblood of open scholarly communications. Without a major intervention to protect this crucial aspect of the public sphere, private conglomerates will within several years be able to do to scholarship what their peers in criminal justice and security fields have been doing to national prison and defence systems in the name of neo-liberal efficiency. We desperately need more alternative solutions to help prune the garden and make space for natural growth of academic knowledge creation and dissemination. Little of what we said so far should come as news to anyone who is generally informed about the world of scholarly communications. Unfortunately – and that is sometimes easy to forget – few academics are, not to mention the general public. And of the former group, it is true that broader issues of sustainability tend to play a minor role in how they decide where and how to publish, peer review, or edit. It is hard to fault our junior colleagues for thinking first about a journal’s (or a publisher’s) reputation and only later consider their open access (OA) policies. Yet, by the time we survey our more established and senior colleagues, paths have long been determined, coalitions and editorial boards forged, and a combination of inertia and addiction to a certain kind of prestige often gets the better of otherwise engaged and critical minds. As Barbara Fister writes, many researchers approach the issue with indifference: ‘Access to knowledge – that’s somebody else’s problem. This uninformed indifference is laying the groundwork for … a world in which knowledge is turned into intellectual property, monetized, and made artificially scarce.’2 To make matters worse, private and public funders’ misconception of open access as a business model – or something that can be solved by throwing money at it – often manifests in the creation of special subsidies to publish the research they support, unfortunately in ways that do little more than pour money directly into the large coffers of for-profit publishers. These well-meaning funders are essentially pouring plant food directly on the invasive species and encouraging their already rampant growth. That is the opposite of clearing the garden and creating sustainable infrastructures for scholarly communications. At ScholarlyHub,3 we think that the solution has to come from effecting a broad cultural shift; one that builds on strong awareness and commitment in certain circles, both in and beyond academe, but that does not rely solely on them. For this shift has to provide, in the not-too-distant future, a sustainable model for reducing the cost of knowledge; and this sustainability is more likely to develop by getting many different stakeholders on board, not just those who have a strong commitment to science or social justice. A successful, co-ordinated effort must therefore strive to scale the number of participants up, and quickly, to ensure critical mass. To our mind, that means starting at the front end, by forming a visible, attractive and vibrant scholarly social network for a variety of scholarly communities of practice, in lieu of simply seeking wealthy backers. It also means looking to build and include support outside the traditional boundaries of academia. It is this type of commons, designed to meet the basic needs of diverse communities of scholarly practice, that will lead to a significant up-tick in a relatively short amount of time, without necessarily relying on mass mobilization of resources or a pre-commitment of learned societies, publishers and other organizations – although that would no doubt help. The bad news about beginning at the front end is that it is costly to set up, especially when your resources are minimal – as ours are, although donations are coming in. The even worse news is that setting up a social network without an existing constituency (e.g. a learned society, a university, a school system, a consortium of NGOs) is risky, since people are less likely to join without critical mass. And just to add to the challenge, we will be asking those who will join to pay membership fees, however modest, when they can get some (but not all) of our services elsewhere for free, at least for the time being. The good news, however, is that important elements of a possible back end are already there, interoperable and not-for-profit. It is here, behind the social network façade, that years of individual and foundation-driven efforts may finally pay off on a large scale. Preprint services, indexers, review and editing protocols, safe mentoring spaces, conference wikis, social media feeds, metadata generators, and of course real OA repositories (decentralized and not) with stable and secure APIs: each and every one of these, provided they are committed to truly open access, open source, and public benefit, can play a major role in effecting a desired shift. Our November 2017 launch has received significant media interest, with several articles published4, 5, 6 followed closely by a number of interviews.7, 8, 9 Within our advisory board,10 which represents a diverse group of researchers across multiple disciplines, we reached out to our own social and professional networks directly via e-mail, as well as through the ScholarlyHub website and social media accounts. Each of these channels turned out to be quite popular with open access scholar-activists and a range of other scholars around the world. Among the latter group, it was clear that some were learning for the first time about the increasingly toxic ecosystem within which they publish, access, or share scholarly work. Within less than a month, more than 1,000 people signed up to our newsletter, nearly 2,000 began interacting with us regularly on Twitter and Facebook, and nearly 10,000 unique visitors visited the website. Beyond calling attention to our plans, we also managed to establish ourselves as one initiative among several – including Humanities Commons and the various existing disciplinary repositories, such as arXiv, Open Journal Systems, and Open Science Framework – who want to clear the scholarly garden and challenge the status quo. Invitations for conferences, seminars, workshops, interviews, blog posts, and articles, such as the present one, soon followed. Given the great record and sophistication of existing initiatives, it was heartening to receive such attention early on, and we hope to continue building on this positive, forward-moving momentum to earn the trust of scholarly communities around the world. If we spotlighted existing platforms, we see that, too, as a success. The profound cultural change we want to help effect is not a zero-sum game; there is much ground to reclaim and the more hands weeding out the garden, the better. The co-operative spirit is hardly unique to us at ScholarlyHub. Within this period, different organizations have reached out to us – including learned societies, grass-roots organizations, libraries, open access publishers, ORCID, OSF, and numerous individuals – formally and informally connected to major stakeholders in open access. They have convinced us that a co-ordinated attempt is possible, especially in the back end, and stressed the importance of our intervention in the front end. Creating a new type of digital commons for scholars of different stripes seems to be a plan many wish to see brought to life, and they view the fee-based membership model we seek to test as a surmountable obstacle indeed, especially once the cooperation of enough communities of scholarly practice and other major stakeholders is secured. Out of these preliminary talks and our in-house discussions, it seems that moving forward, with minimum redundancies, is quite possible once the social network portal is set up. We have already laid out the portal’s basic design11 and user interface and shared it with our subscribers and supporters (see Figures 1 and 2 below). Our innovative designs reflect a strong commitment to inclusivity across disciplines and beyond academe and to meeting the needs of a variety of scholarship-using communities. And by and large, they have been received as such. Beyond producing a critical and empowering meeting place, it is imperative that the site be designed for interoperability with key services already being offered, including, in particular, existing open repositories of preprint and formally published work, so that members can immediately upload and share their scholarship. Therefore, we continue to consider how to integrate existing publishing software and protocols with opportunities for the creation and sharing of new, innovative, and ongoing work. This can be done by inviting individuals and groups to create new journals or to migrate their existing journals and platforms to our framework. These are just some of the initial considerations we are exploring with potential partners among a wide range of scholarship-using communities. It is out of these community-driven discussions that we will continue to work together to think beyond these services and develop further ones, such as those related to teaching and mentoring. Last but not least, donations. Three weeks after announcing our plans, we began gathering the necessary funds to realize those plans, with an initial target goal of US$622.000. We chose not to use crowdfunding sites and opted to work mainly through our website for the sake of efficiency and cost savings. We knew in advance that the target was ambitious and estimated that it would be possible, even desirable, to reach it by spreading the burden as widely as possible, combining small donations from enthusiastic individuals and large ones from private or institutional donors. After all, our goal is not to wipe out the entire garden with weed-killer but to carefully and thoughtfully clear portions of the garden to make room for more and wider efforts. During the first month of the campaign, we raised around US$622,000 from about 75 individuals. Our donors were people who gave to our cause without asking for anything in return other than seeing the site go live and allowing them to become members. There are many more like-minded people out there, and we hope to reach them as well; meanwhile, we need to broaden our efforts to find people who would help the campaign with enough motivation and identification with our efforts. That is why, in subsequent weeks, we shared more specifics about our designs and offered those who donate upwards of US$25 (US$10 reduced rate) a year’s free membership once the site is up and running. Direct fundraising is key to our success, particularly as a demonstration that a grass-roots effort can help turn the tide or – to stick to our original metaphor – reclaim the garden. It is too early to tell what is on our horizons, but the enthusiasm with which our plans were received, and the support they lent directly and indirectly to initiatives whose agendas and values we strongly share, bodes well for the future of independent scholarly communications. The alliance of non-profit services we wish to integrate and synergize will succeed by bringing a critical mass of scholars and scholarship-using communities into one or several main environments. We believe we can make a difference in helping to clear and reclaim the scholarly garden, and we invite others who agree that we can to join us in these efforts. Together, we can build a better, more open culture of scholarly creation, communication and sharing. April Hathcock is an advisory board member of ScholarlyHub and Guy Geltner is the founder and community director of ScholarlyHub. Kelty C M, 18 May 2016, It’s the Data, Stupid: What Elsevier’s purchase of SSRN also means, Savage Minds Blog: https://savageminds.org/2016/05/18/its-the-data-stupid-what-elseviers-purchase-of-ssrn-also-means/ (accessed 6 February 2018). Fister B, Liberating knowledge: a librarian’s manifesto for change, Thought & Action, Fall 2010, 83–90: http://www.nea.org/assets/img/PubThoughtAndAction/A10Fister1.pdf (accessed 7 February 2018). 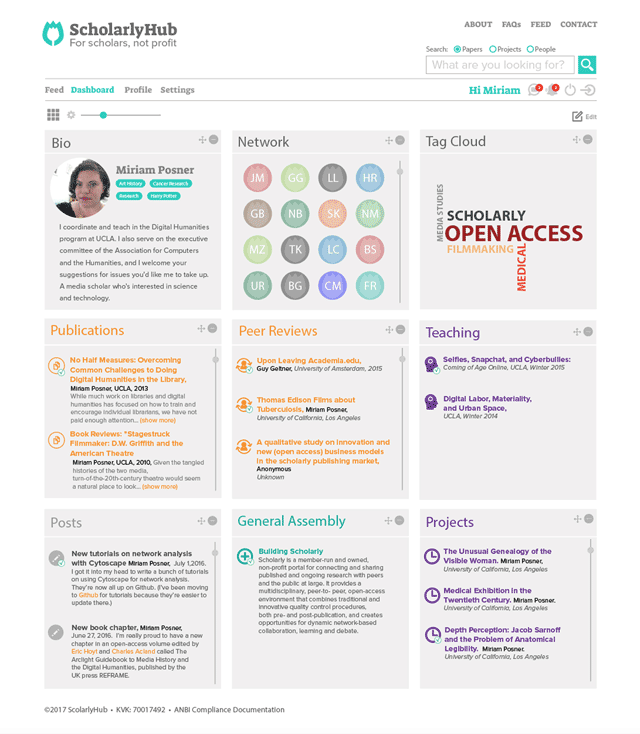 ScholarlyHub: http://www.scholarlyhub.org/ (accessed 6 February 2018). Matthews D, Scholars launch non-profit rival to ResearchGate and Academia.edu, Times Higher Education, 8 November 2017: https://www.timeshighereducation.com/news/scholars-form-non-profit-rival-to-researchgate (accessed 6 February 2018). Gallardo C, Academics push for Alternative to ResearchGate, Research Fortnight, 8 November 2017: https://www.researchresearch.com/news/article/?articleId=1371337 (accessed 6 February 2018). McKenzie L, A nonprofit alternative to ResearchGate, Inside Higher Education, 9 November 2017: https://www.insidehighered.com/news/2017/11/09/scholars-plan-nonprofit-alternative-researchgate (accessed 6 February 2018). De Knecht S, ScholarlyHub bindt de strijd aan met Researchgate en Academia.edu, Science Guide, 27 November 2017: https://beta.scienceguide.nl/2017/11/scholarlyhub-bindt-strijd-aan-researchgate-en-academia-edu/ (accessed 6 February 2018). Rogers A, It’s gonna get a lot easier to break science journal paywalls, Wired, 3 December 2017: https://www.wired.com/story/its-gonna-get-a-lot-easier-to-break-science-journal-paywalls/ (accessed 6 February 2018). Johnson S, Researchers ask: does academia need another alternative to for-profit scholarly platforms?, EdSurge, 16 November 2017: https://www.edsurge.com/news/2017-11-16-researchers-ask-does-academia-need-another-alternative-to-for-profit-scholarly-platforms (accessed 6 February 2018). The ScholarlyHub advisory board: https://www.scholarlyhub.org/whos-involved (accessed 6 February 2018). The Platform: https://www.scholarlyhub.org/feed/2017/12/10/the-platform (accessed 6 February 2018).